First, a little background behind the featured image : last July, we attended Japan Expo in Paris as visitors, and luckily for us, the great utaite Kanipan (かにぱん。) was part of the guests this year. In late 2013 and early 2014, Kanipan was kind enough to do two collabs with us, which are now part of our dearest memories, so of course, we just had to come and say hi. 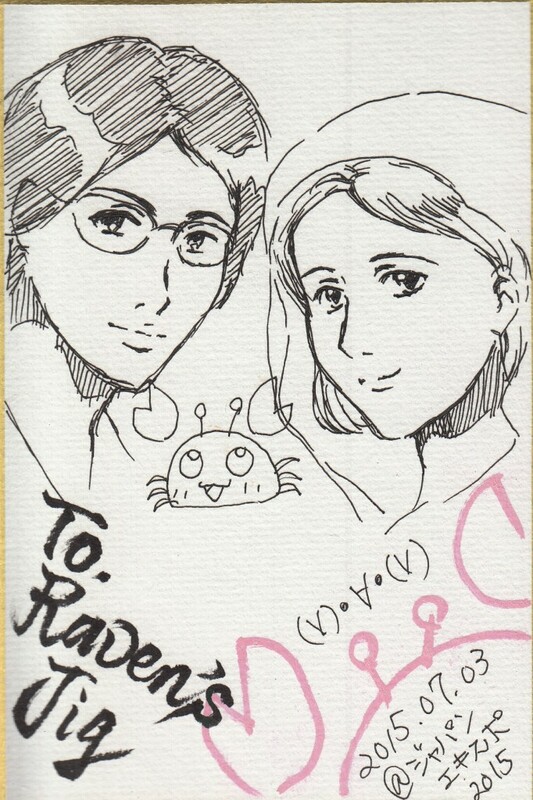 Not only did Kanipan recognize us and greet us warmly, but she was also kind enough to draw both Raven’s Jig members in her amazing drawing style! Thank you so much, Kanipan. We well never forget this meeting! During the past few months, Raven’s Jig has been looking back on their lives and their previous achievements in hopes to take it as an incentive to move forward. First demonstration up to illustrate this fact is our new, improved version of “Armstrong”, probably one of our oldest arranges at this point, a cover with unchanged lyrics of a song by Claude Nougaro. Incidentally you might recognize the melody from somewhere else : Nougaro’s song itself is an arrange of the classic known as “Go Down Moses”. A cover of a cover? Covers intensify! Next up is an arrange of another song by Ludovico Einaudi (see previous post for further information), because once you’ve become hooked on his music, you cannot turn it off. To this song, “I Giorni” (literally “The Days”), we wanted to add lyrics particular to our very own Onne’s personal story. Onne’s moved away from his home for the first time last year, something I myself have become quite used to at this point, but it’s always a tough turn to take… It did give us inspiration to write something about it, though. What happens when you lose your previous home and possessions along? How do you move forward? With our arrange of “I Giorni”, we tried to tell a little story to suggest an answer. We are now all the more motivated to move forward and keep you updated with new arranges as soon as we can. Until then, thank you for your patience.